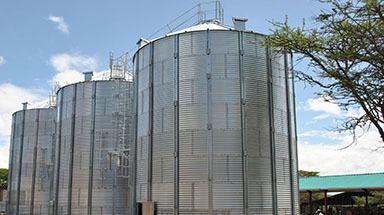 Hopper bottom silos are all designed, detailed, programmed and manufactured by Bentall Rowlands. The design is based upon loads and pressures derived from either the German DIN 1055 1987 or Eurocode 1 part 4 with structural calculations based on BS 5950 part 5 or Eurocode 3. Standard ranges from 3m diameter 15 tonnes storage to 10m diameter 1,700 tonnes, all hoppers are designed for high cyclic loading, i.e. high usage of product in and out and at high tonnage rates. The 45 and 60 degree hoppers are standard (other hopper angles upon request). Silo roof panels, wall sheets and stiffening struts (up to 3mm thick) are sheared and formed from pre-galvanised steel sheets, with a minimum of G600 galvanising. Stiffening struts (thicker than 3mm) are sheared and formed from black steel and hot-dip galvanised to finish after manufacture, as too is the supporting entablature steelwork. 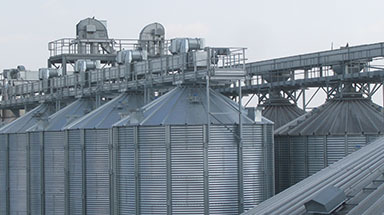 All of Bentall Rowlands’ silo ranges are designed, detailed, programmed and manufactured at one site. 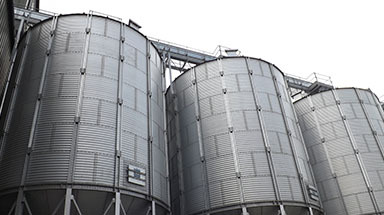 One benefit of this is that we can, and often do, manufacture non–standard silos and hoppers. So if your needs are different from those in the standard ranges please do not hesitate to ask. 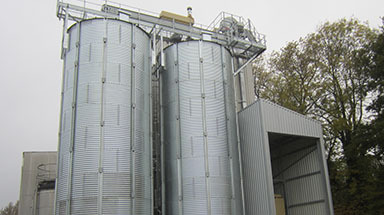 Hopper silos can provide temporary wet grain storage as part of a grain drying plant and other “buffer bin” applications in silo plants. Storage of other free flowing granulated products, wood pellets and feed pellets in relevant industrial plants. Medium term grain storage where fast discharge of large batches of grain are required (sea and river ports, breweries, malting, mills). 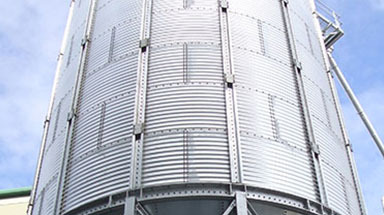 All silo parts are made from certified pre or hot-dip galvanised steel. High specification G600 galvanising provides outstanding corrosion resistance. Uses: agricultural, food complexes, sea and river ports, breweries, bio-fuel etc. Optimal solution for quick unloads of large amounts of any granular loose free flowing materials: cereal crop, granular polymers, wooden granular fuel, granular fodder etc. Subject to review by our in-house engineering team. Assembled from individual corrugated steel sheets with vertical stiffeners, the effective height of each ring of sheets is 1.185m. Sheet thickness varies according to the load experienced in different parts of the silo. Bentall Rowlands design the wall make-up using sheets from 1mm thick, whilst the bottom ring can be up to 5mm thick. 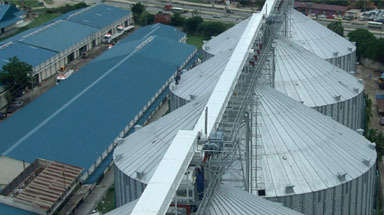 All Bentall Rowlands’ silo sheets are shallow corrugated to improve product flow inside the silo. Each silo cylinder generally has two rows of vertical external stiffeners per wall sheet. Taller silo walls have three rows of stiffeners per wall sheet. Conical roof with 30° slope, assembled from individual trapezoidal panels. 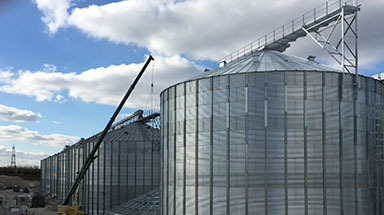 Bentall Rowlands have self supporting roofs on standard silos up to 9.0 m in diameter, for larger diameter silos we offer a rafter supported roof. Any electrical equipment used in Bentall Rowlands’ silos can be supplied for use in explosive atmospheres according to ATEX directives. 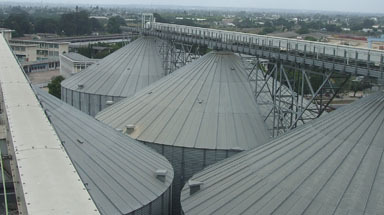 Silo roofs can be fitted with vents, temperature cable brackets, inspection hatches and high-level indicators. The roofs fully protect the stored product from the weather and vermin. All silos designed by Bentall Rowlands can, in most cases, bear the full load of the catwalks with even the heaviest handling equipment on top of them negating the necessity for catwalk-to-ground supports. This can offer significant savings compared to our competitors. Standard Bentall Rowlands hopper bottom is a 45° cone. On some diameters other discharge cones are available i.e. 50° or 60° cone as an option subject to review by our engineering department. 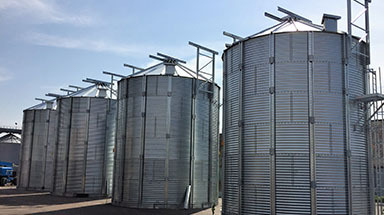 Bentall Rowlands hopper silos have a smooth wall-to-hopper transition with no steps or flanges and the cone is assembled with special round-headed bolts to offer the cleanest possible product discharge from the silo. An optional bolted door can be fitted in the hopper cone which allows safe and easy access. 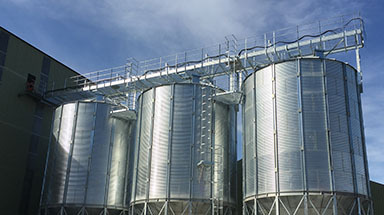 Bentall Rowlands’ silos are assembled using spun galvanised fixings. This type of coating provides high corrosion resistance while preserving the nominal dimensions of the threads, making for easier silo assembly. Neoprene backed washers protect the zinc coating of the sheets during assembly and seal the bolt connections. Bentall Rowlands’ industrial grade hopper bottom silos are supported on a rolled ring beam, rather than on extensions of the wall stiffeners as offered by some of our competitors. The entire support structure and the ring beam are hot-dip galvanised. A double ring beam support structure is fitted to the larger diameter hopper bottom silos to ensure stability of the cone. All stored crops respire in storage and therefore a rise in temperature within the silo is inevitable. Low volume aeration systems maintain the stored crop at temperatures close to that of the ambient air, so preventing the build-up of heat which would allow insect reproduction activity to increase, moulds to grow and so damage the stored crop. *Lateral and fan sizes calculated to provide 6.8m³ of air per hour per tonne of grain in any silo model. Bentall Rowlands hoppers can be used in conjunction with independent or integrated support structures allowing for load out operations.